Today is National Chocolate Pecan Pie Day. When I first discovered such a holiday… I immediately remembered a Chocolate Nut Pie my mom used to make. 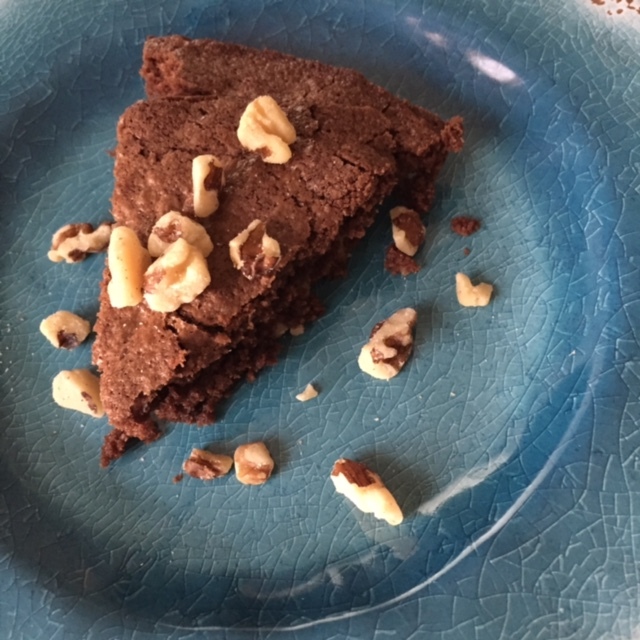 It was never considered a family favorite – so I’m not sure my children ever tasted it – but I remember the novelty of eating a circular brownie and thought I might share the recipe. However, I wasn’t quite sure where to find it. I knew Mom frequently used River Road Recipe cookbooks, so I began there. No luck. I searched the other Junior League and church fundraiser cookbooks, but still no luck. So I decided to cull through her recipe tin. What a journey to the past! I spent several minutes looking at old childhood favorites (and many untried ones as well). I won’t be lacking in Recipe posts for a while. Some were in Mom’s handwriting – a treasure in itself – but many were torn from magazines or newspapers and preserved in these plastic sleeves. I wonder what I can learn about the past by analyzing these recipes? Sounds like another facet of my ongoing family history project. Blend in sugar and melted butter. Combine flour, cocoa, and salt in a separate bowl – then add to the egg mixture. Pour into lightly greased 8-inch pie pan. The pie is good on its own… or you can make it especially indulging by topping with hot fudge and vanilla ice cream. Ooooh I like the sound of this and I bet vanilla ice cream would be awesome with it! What I really like is that I pretty much ALWAYS have the ingredients on hand. Perfect for a last minute dessert. Yum! 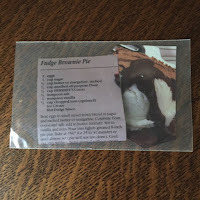 I have a fudge brownie pie recipe coming up to try and I'm excited about it. This sounds really good and I love chocolate pecan pie. I'm making German Chocolate Cupcakes later today for a party and while they're not a chocolate pecan pie the cake is chocolate and the icing has pecans so it kind of counts right? I'm a chocoholic, so this sounds amazing to me. I'm bookmarking it. Temptation! You've captured almost everyone's weak point with this recipe — which conveniently doesn't need baking chocolate. Thanks. I think it counts 🙂 German Chocolate cake was my dad's favorite. Maybe I should try that sometime this fall. It is good for a chocoholic tooth 🙂 It has a mild chocolate flavor, but a good quick fix. I agree… I never have baking chocolate in the house. Oh boy this looks delicious.